Register for one class or a year of classes. 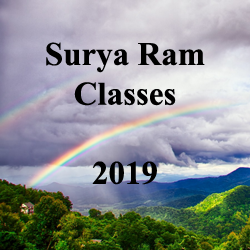 For more information about Surya Ram Classes, including prerequisites, click here or call (828) 627-6200. Tuition does not include lodging. For Mount Soma lodging, call 828-476-4073 or email reservations@mountsoma.org. See below for California lodging. To register by phone, call (828) 531-9946. Be sure to read Before You Come to Class and the Refund/Cancellation Policy. Students may register for one class or a year of classes. There are two 3-day classes on each coast in 2019. With the Standard Option, participants attend all meditation rounds during class, balanced with daily activity shifts (cooking & clean-up) for deeper integration. The Executive Option is for those who need to keep up with work responsibilities during class. These individuals can forgo the activity shifts that course participants engage in daily and use that time to take care of business, while still receiving the benefit of Surya Ram Classes. Tuition cost is increased for those who choose this option. A $108 late fee will be added if you register less than one week before class. This applies to registering for the full year of classes, and also when you register for an individual class. All classes are Friday – Sunday.